The Bowels are less a network of caverns than a jumble of warrens. The tunnels branch and converge, expanding to grand galleries and narrowing to passages barely wide enough for a halfling to pass through. One scholar has remarked—barely in jest—that a complete map of the Bowels could function as a symbol of insanity. Throughout the caves, twisted bronze pipes adorned with weathered runes wind their way up through the bedrock from gleaming veins of thaumatite, channeling its magical energy to the Old City above to power its arcane devices. Though ancient, many show signs of recent repair, with patches of fresh metal contrasting with the patina. The thaumatite’s pallid glow also fuels the growth of many fungi unknown elsewhere; it is these that undergird the strange ecology in the tunnels. And ecology the Bowels have, as well as society. Nearer the surface are bands of outcasts from the Old City, cults, thieves, and colonies of those who believe the thaumatite’s glow will cure their illnesses. Further in live creatures who rarely fit into surface life, such as goblins and gnolls. They constantly vie for the richer veins where more of their strange crops can be gathered, and the paucity of resources has made most groups hostile to strangers entering their territory. Residents of the Old City fear clans of these creatures disturbing the pipes, but the clans have little reason for such vandalism and fear retribution from hired topside adventurers. Deeper below the surface and farther from the sun lay stranger things. Monsters, yes, but caves everywhere have aboleths and worse. As one plumbs deeper into the Bowels, strange white marks begin to appear on the walls. They could be pictograms from some unknown beings, but their construction is baffling. Rather than being scratched into the wall, the marks are veins of calcite, the surrounding rock having eroded in specific patterns to reveal it. All attempts to translate these etchings have failed, but many scholars insist that certain patterns prove that the markings are an unknown script. Even more perplexing are the pipes. Nearer the surface, their origin is somewhat obscure, but they are clearly of ancient manufacture. The ones deeper down seem new. Completely without patina, the bronze still gleams and the runes are crisp. The few scholars who have studied them remain puzzled, but one proposal is especially troubling: the pipes are growing towards something. The overall description about the Warrens is compelling. I want to know more about the ancient origins of the bronze pipes and the strange white marks. However, you missed a huge opportunity in tying this lore to the map. Other than a single reference to goblins, there is absolutely nothing tying the map you present to the location’s overall history. Just a little bit of a nod to that with respect to the overall theme would have been enormously helpful. Do the goblins venerate the cave network’s forgotten creators? Do they sacrifice visitors to the dark creatures of the deeps they worship? Are they responsible for expediting the erosion process to reveal the strange patterns? The map does a great job of labelling the various areas, and it makes sense as a generic goblin encampment. However, it becomes contextless without supporting text. I don’t know anything else about the encampment. The “Toy Storage” area seems interesting. A sentence describing why the goblins have a toy room, or what exactly they mean by “toys,” would have been wonderful. Your writing is clean. I found very little that tripped me up when I read it, and I didn’t notice any glaring grammatical errors. The only major issue I observed was a tendency to tell the reader about the region. For example, you could have eliminated the sentence “And ecology the Bowels have, as well as society.” The follow-on description does a decent job of showing exactly what you stated in that sentence and would have flowed without any issues from the mention of the strange ecology in the previous paragraph. Overall, the fascinating description about the overall region is harmed by the complete disconnect with the map. With just a little bit tying the two together, this could have been a contender, in my mind. As it is, I cannot recommend this location. Congratulations, Jeff. Putting yourself out there to compete in anything is hard, and designing RPGs is hard. Particularly designing adventure settings or locations. You have to be able to suggest some ideas about personalities, plots, terrain, and more, and have GMs chomping at the bit to add your location to their regular game. Let's see how you did! I believe in positive feedback and honest criticism that should make you better at every part of this gig. So to start positively, I want to say that your map is darn near adventure-ready. It could benefit from a cartographer's love, but as far as running encounters, it's good to go. Turning those over with adventure text cuts down on time and costs for publishers. The idea of a magic substance called thaumatite is interesting. Atlanteans draining the power out of their foundation until it crumbled and they sank into the waves. A city of layers, where monsters underground grow magic fungus for food. Kind of neat. I think there's a lot of missed opportunity here. Are there tremors in the earth where the pipes grow toward something ancient? Does thaumatite (or the fungus that grows in its soft light) cause mutations or alter magical energies? 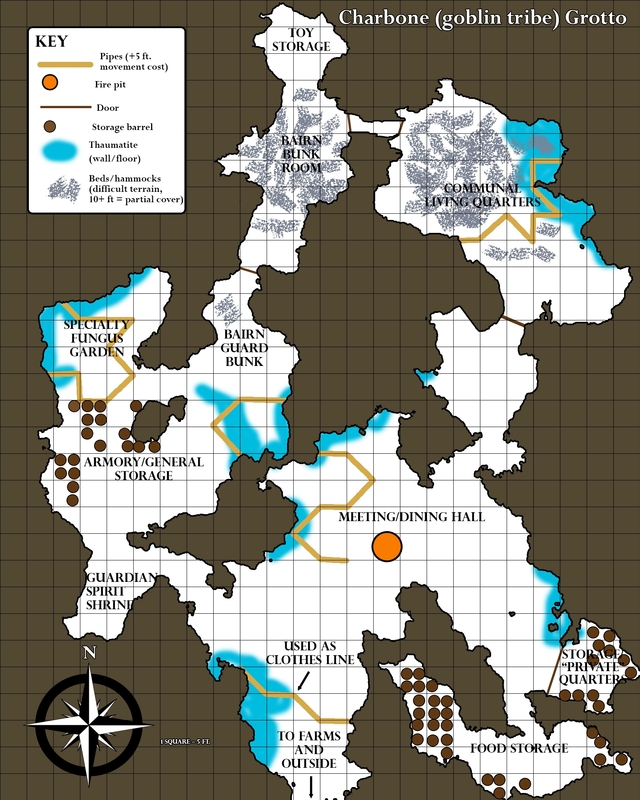 I feel you've suggested some encounters and given a regional location that could get more deadly as our heroes descend into the dark caverns to explore the mysteries that frighten even the trolls and aboleths. But you only allude to the dangers. Then you give us a great map, but it's waaay more about a goblin cave than it is the relatively small amount of ore and piping you provided. Even there, you started by describing chaotic warrens, then you plant goblins, which are Small creatures, in some spacious caves. Why not give us a vital reason for Medium sized adventurers to have to squeeze into the warrens and deal with traps and combat in such confinement. Suddenly level 1 goblin rogues are a menace! Adventure locations benefit from focus. Stick to the central theme of the unusual pipes and don't bury the lead (the pipes are ancient and no one actually built them?). Giving us texture and danger around the pipes is essential, but do it in the context of the pipes. The humans complain they are noisy and it sounds like something is crawling inside them. The goblins overpopulated and started killing each other to make fertile ground for more fungus. Below, dark elves view the encroaching pipes as an act of war. Maybe up above, reckless sages are draining the natural resource for mythic spells, forcing the pipes to seek out more thaumatite. If you advance, please give us the good stuff next round. Don't hint at it. The Bowels is an interesting location, effectively a campaign neutral version of the Darklands or Underdark below an arcane-powered city that is rife with possibilities. I really love the line about the full map functioning as a symbol of insanity, as that really encapsulates what it's all about while the presentation further immerses us into the world itself. The Bowels allows for a variety of adventure choices that could certainly feature combat, as well as social interactions, at a variety of levels. I like all of that. Unfortunately, like Mike and Steve, I struggle with the map. I don't mind as much that it's not really mentioned in the prose; the rules say the map may be a small section of the location and it's clear to me this is in the Bowels. But I don't think the map really works well. I don't understand why the only apparent entrance to the complex is guarded by a clothes line, while the armory and guard bunk are deeper in. The rooms/caves are interesting shapes and large enough for the combat that will likely break out here when the PCs arrive, but there are few options for the players, which means it's going to be less fun. The complex is basically a single loop in which they can either go left or right at the start, with one small option at the bottom right of the map for players to go in a different direction. It's important to give players a choice (or sometimes the illusion of a choice) and this map fails in that regard. This is another entry on which I'm torn as there are parts I really like and parts that I don't. In the end, I'm afraid I do not recommend this for advancement, but I could certainly see the voters disagreeing with that assessment. Nicely done completing Round 2. First, from the standpoint of submitting this to a cartographer for publication, I think the map is solid on its own merits. We can see important features and know what each room is intended for. Second, from an exciting encounter standpoint, it has some things going for it. You've got some interesting terrain features and such. You've listed the pipes and their effect on movement. However, in almost every case, the pipes aren't in any position to truly affect or inhibit any tactical movement or combat, either being off against a wall or in an area that won't be in combat most likely. The very first pipe encountered is also listed as being a clothesline, so that's probably at least head height and unlikely to be a hindrance (unless dangling laundry accounts for that particular pipe's movement penalties). At its base, the map is a goblin hole, assuming we can find a reason for the PCs to want to invade it, it works well for that, but there isn't really anything compelling that makes me want to send PCs into it. It's not even a passage deeper into the Bowels or anywhere else, the exit just goes to farms and outside. It works if I need to place a home for random wandering goblins the party has been encountering or if I need a place to put something exciting to be found or located, but by itself it isn't exciting. The pipes don't add anything I couldn't just do with rocks on the ground or tangled underbrush and the thaumatite tiles don't have any apparent effect (unless I give them one) on those moving through them.